This Star Log.EM-installment clocks in at 7 pages, 1 page front cover, 1 page editorial, 2 pages of SRD, leaving us with 3 pages of content, so let’s take a look! 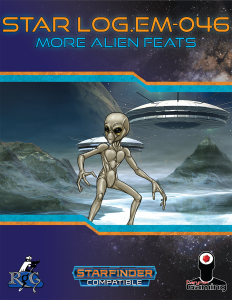 We begin this supplement with a brief piece of cool flavor, which codifies alien species like reptoids, mi-go, etc. as “Enigmalice” – which is genius. Depending on the threat level and your stance on the species, you could emphasize “enigma”, “malice” or “lice.” This is a really clever neologism that made me smile with glee. -Gray Telepathy: Nets a lashunta’s limited telepathy; may be taken additional times for better telepathy. -Alien Presence: Nets you frightful presence, activated by 1 Resolve Point. The activation and duration are covered by the universal ability’s default, and 5th level plus Gray Telepathy make for a valid prerequisite array. -Sleep Paralysis: Builds on Improved Gray Magic (from the first Star Log: Alien Racial Feats-file) nets you the sleep paralysis ability. Contemplatives can choose Contemplative Telepathy, which is identical with Gray Telepathy. Disappointing. Drow may choose the Create Darkness feat, which nets the universal creature ability 1/day. The darkness lasts for character level or CR minutes. The feat may be taken twice; the second time, it can be used additional times, with 1 Resolve Point cost for uses beyond the first. Dragonkin of 6th level and beyond can choose Resolute Breath Weapon; after using the breath weapon, roll 1d4. After this result is recorded, you can spend 1 Resolve Point to use the breath weapon again after a number of rounds has elapsed that is equal to the recorded result. Like it! Very strong, but it makes sense to me. The ikeshti, provided they have at least 3rd level, can spend 1 Resolve Point to use squirt blood an additional time without having to rest. Sarcesian subtype’d creatures of 3rd level or higher can choose Void Soaring and spend 1 Resolve Point to increase the void flyer’s time to function in a vacuum without breathing for a number of hours equal to the level. This time may further be doubled by spending 2 Resolve Points Additionally, the fly speed granted by void flyer increases by +5 ft. at 3rd level, + another 5 ft. for every 2 character levels, capping at 120 ft. in vacuum. A shobhad with Con 12+ can act normally for 1 + Constitution modifier rounds when using ferocity. Reptoids can use change shape at-will and with an indefinite duration if they take Extended Reptoid Shapechange, which is pretty much what they should have been able to do from the get-go as far as I’m concerned. Barahthu get the most out of this one: Enhanced Barathu Brawling requires Improved Unarmed Strike. When using early stage adaptation, unarmed strikes don’t count as archaic weapons and gain a special weapon specialization equal to 1-1/2x character level. As a nitpick – it’s clear that this is supposed to be added to damage rolls, but RAW, the pdf fails to mention that. Enhanced Barathu Resistance nets you resistance to an energy type equal to your BAB when using early stage adaption. RAW, these two only work for early stage barathus, though, as the ability of the regular one’s feature is called “Adaptation.” This also may be the reason why Greater Barathu Adaptation erroneously references “Improved Barathu Adaptation” as a prerequisite feat; I couldn’t find that one anywhere. The feat allows the barathu to add barbed quills, DR-granting plates, echolocation or a base speed to the array of “early stage adaptation” options – which, once more, is a bit odd, as the grown barathu doesn’t have the ability; the feat may be gained as an alternate class feature a certain levels, and may be taken multiple times. Urogs can choose the Extended Electroconductor feat that makes semiconductive last for a minute and lets the urog end the trait’s effects as a free action. The pdf also contains 2 new witchwyrd feats, both of which have a minimum level prerequisite of 5th level. Force Bolt Amplification lets you spend 1 Resolve Point to 1d6 +1 + Charisma modifier; the base damage die further increases at higher levels. Improved Absorb Force lets you attempt to absorb force energy from force effects that damages a target or includes you in the AoE as a reaction. The rules here are very complex, and manage to get the different instances done right. A really impressive one. Goblins get two different feats: Honchohead Screech nets a goblin of 7th level or higher disturbing screech, using character level and key ability modifier to determine save DC. Unstable Tinker lets goblins wielding heavy, longarms, small arms or sniper weapons crafted or repaired add in an overclock switch that may be activated as a move action. This requires an Engineering check, with DC scaling with item levels. On a success, the overclocked weapon is overcharged for 1d12 round, +1 round per 5 beyond the DC. Overcharged weapons deal additional damage, which starts off at +1, and increases to scaling dice at 8th, 12th, 15th and 20th level. After overcharging a weapon thus, it does become broken, though. When you roll a natural 1 with an overcharged weapon, the effect ends immediately, the item is broken, and then is destroyed instead when the ability ends. Editing and formatting are good on a formal and rules language level. Layout adheres to a two-column full-color standard, and the pdf has a nice piece of artwork. The pdf has no bookmarks, but doesn’t need any at this length. David N. Ross’ second array of Alien feats has a couple of true gems, but also a couple of minor snafus among the barathu feats. The fact that two of the feats are pretty much identical is also a minor bummer. All in all, I consider this to be a solid offering, and hence will award it 3.5 stars, rounded down by a margin, as there are a couple of pretty basic ones here. You can get these feats here on OBS.